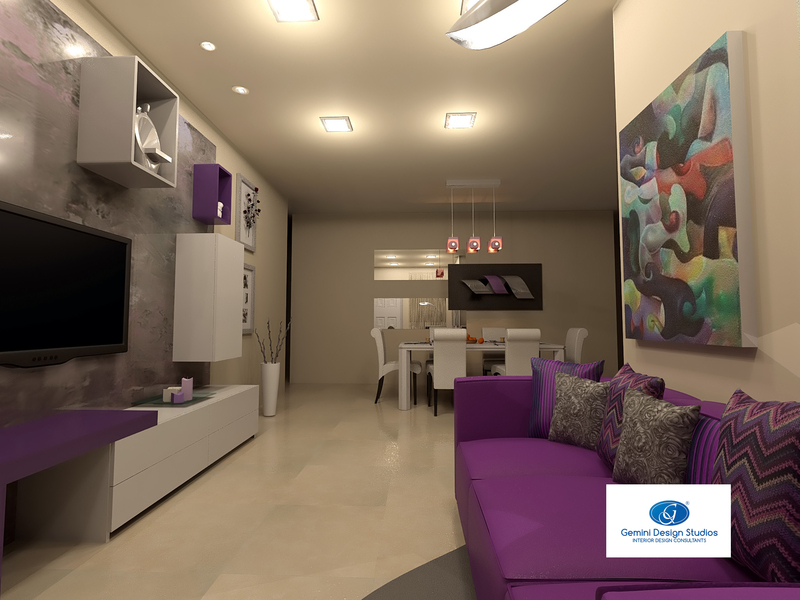 DESIGNING A LIVING ROOM WITH PURPLE TONES | Interior Design Malta – Gemini Design Studios Ltd. It is common knowledge that with the introduction of bold colours when it comes to designing a room, there is the risk of stepping over the line, with the consequence of losing interest in the decor after a few months. We at Gemini Design Studios take extreme care in setting the right balances when it comes to the introduction of bold colours such as purple, lime, orange and similar bright tones. In a living room such as the one on display, we created an orchid background for the walls and ceilings, as a neutral palette in order that we can add a balanced dose of purple. We chose the sofa as the main feature, and then the overlapping low table sprayed in gloss purple, as well as the hanging open display boxes, against a background of light grey with touches of purple venetian plaster, to add a touch of elegance. The frontal feature consists of two separate rectangular mirrors overlapped by a hanging glass sculpture with a purple tonality as well. The mirrors were inserted in the decor to magnify further the premises, resulting in an explosion of light and colour leading to a plush living area with soothing colours …..a pleasurable invitation for the owners to unwind in relaxed and youthful settings .